The fashion industry has gotten very high tech in recent years and virtual reality fashion is hot. Today we are going to address some of the latest VR fashion developments. Everything from augmented reality to smart fabrics. Even Pixar has been dipping a toe into the area. The iPhone X will get a new feature on December 1st that will enable users to have filters applied to their iMessage in much the same multi-dimensional scheme that Snapchat and Instagram. These filters will be based around fashion trends from Spring and Summer of 2018. One example that Vogue has released is being able to add a disco glamour to your front facing photographs. Releasing these filters is only the first steps of augmented reality Apple has planned along with Vogue. Amazon’s Echo is fairly well known and now they have another Echo device, the Look. Echo Look is an echo with the additional feature of a camera. The camera is used to take pictures of you in outfits. When you need style advice, you take pictures of you in multiple outfits and then Alexa will tell you which outfit is better. Alexa uses machine learning and artificial intelligence to help pick out the best styles. With the help of this app, fashion sense can be enhanced and helped. Amazon isn’t the only company using the power of computing to work with fashion. A computer science professor at Cornell University has developed a way to analyze social media to determine fashion trends in a city. The program is able to plot out how often people are wearing specific outfits, down to the city level. The one problem with using artificial intelligence to judge fashion styles is that each person has their own unique style and the computer needs to be able to take that into account. Machine learning needs time to learn each person’s style and Echo is still developing the ability to work with an individual’s style. A startup known as Obsess has been using both augmented reality and virtual reality to help shoppers from needing to go to a store. Vera Bradley stores have been utilizing Google Daydream VR headsets to allow shoppers to test out items in a room. They can try out different bed designs and even change the sheets and view different styles. Ikea has been using IKEA Place to allow users to view furniture items in their homes. The Ikea app has been able to attract more users because you can use it with any phone, no need for a headset. JanSport has been developing a new line of backpacks that enable the wearer to share content with anyone who has a smart phone. All another person has to do is hold their camera over the backpack and it will pull up the information that the backpack owner wishes to share. This is done by hiding unique QR codes in the design of the backpack. The stripes that appear to be random in the design of each of the backpacks are not actually random. Each one is specifically placed by a computer to make it unique. A special app will help users to interact and share. The smart fabric backpack has been compared to backpack patches that kids used to wear. But now they are digital and can be changed with a few taps on the phone. Coco is an upcoming movie made by Pixar with a fantasy land known as the Land of The Dead. Pixar has created a virtual reality version of the Land of The Dead that allows users to enter a Pixar movie. With the help of a Oculus virtual reality device, you can experience animation on a whole new level. Pixar is hoping to use the Land of The Dead to make virtual reality more prominent. By bringing animation favorites to life, it will attract more people to get VR devices like the Oculus. The digital world is ever expanding to mix with reality. Augmented reality and virtual reality are just two examples of it. The technology that we have discussed today may sound like it is still just starting but it is opening a gateway to a new line of development. One that will connect industries together. 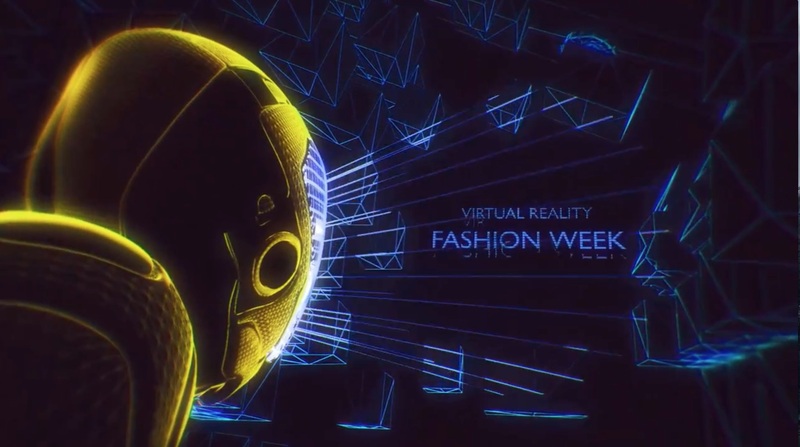 The new promo video from Fashion Week Online has a decidedly futuristic look, but it’s more likely that the future of VR Fashion Week will be equal parts “future” and fashion. Which means you’re just as likely to see Chanel as robots on the VR runway.